This fabulous Bear is a 36cm tall, Limited Edition, Steiff Mohair British Collectors Bear 2014 with GrowlerBCB 2014 is fully jointed and sewn from a pretty mohair with coordinating wool felt paw pads and a vibrant satin bow. He also wears his 110th Anniversary - Elephant - Button in the Ear. This much coverted release is a UK and Ireland Exclusive of 2,000 pieces, and comes boxed with his certificate of authenticity. 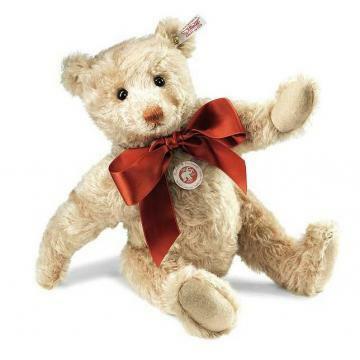 Feedback for Steiff EAN 664380 2014 British Collectors Teddy Bear has been compiled from 0 reviews.